“This is Not a Sound”: The Treachery of Sound in Comic Books | Sounding Out! In comics theorist Scott McCloud‘s seminal work Understanding Comics (1993), there comes a point following his convoluted description of Magritte’s “The Treachery of Images” where he asks the reader, “Do you hear what I’m saying?” In the next panel he adds, “If you do, have your ears check because no one said a word.” The joke is, of course, that while his comic doppelganger is depicted as talking through the use of word balloons, no words are being spoken. We are reading, not hearing. And yet, sound (or rather, its representation) remains a crucial part of reading and enjoying comic books. 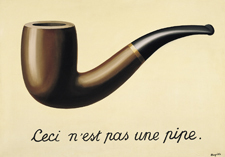 Magritte was trying to get us to think about the treachery of visual representation, while McCloud points us of the treachery of aural representation. A stylized “SPLAT!” is certainly not a sound, but our instinctual understanding of sound helps us to interpret what is otherwise a silent medium in ways beyond the mere the descriptive effect of a sound’s depiction. The way comics use sound can teach us about the function of sound in understanding the visual and textual. As McCloud asserts, comics depend on the reader to create closure between parts of an imagined whole in order for disparate panels to make sense. 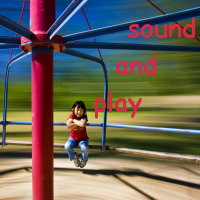 While it second-nature for the comic reader to interpret the depiction of sound in comics, the closure enacted to make stylized textual elements into “a sound” is a central way that this is enacted. The most famous use of comic sound effect words is probably from the old 1960s Batman TV series—where the “SOCK!” and “BONG!” of superhero and sidekick reinforced the campy aesthetic of the program. It is telling that the Batman-theme (and the fight scenes in general) uses horn flares to emphasize those “POW!” and “BIFF!” moments. The suggestion is that the ostentatious representations of sound that these textual flare sound effect words provide are an empty signifier. There is no sound behind that sound. The weak-sounding slaps and smacks of knuckles on flesh would never suffice for the larger than life world of comic superheroes, and the more out-there comics get the more difficult it is to trace a relationship between the textual/visual representation and any sound in the real world. 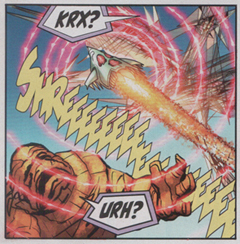 There is no point of comparison by which to understand the “SHREEEEEE!” of a launching “zirrer” in Kurt Busiek’s Astro City, but only the vague evocation of some loud shrill noise. And yet, comic readers not only understand these representations as sound, but there are also a variety of visual clues given that help the reader interpret some quality of those sounds. The most ubiquitous example of sound in comics is, of course, the word balloon—so ubiquitous in fact that it is easy to take for granted the fact that comics have their own conventions for handling and describing sound without recourse to adjectives. The irony is that the shape and texture of word balloons (just like the shape and texture of sound effect words like “BOOM!”) that help to convey the quality of sound become nearly invisible to the reader. Just as any literate person sees a word they know and interprets it for what it is meant to represent and not a collection of individual letters, the dripping icicle-like shape of a word balloon is read as a cold tone or the sharp points of the balloon are read as loud and abrupt. 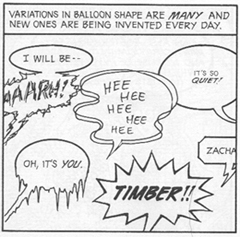 In her essay “The Comic Book’s Soundtrack” from The Language of Comics (2001), Catherine Khordoc provides a very good overview of the use of sound in comics using the example of Goscinny and Uderzo’s Asterix to provide examples of the various ways word balloons and the implanting of onomatopoeic words directly into the panel image itself are used to represent sounds in comic books. Yet, the function of the representation of sound in comic runs even deeper than simply translating the quality of sound itself; it also serves to help establish timeframes for panels (or sets of panels) and functions in establishing the closure the reader performs in making sense of both individual panels and their context within a sequence of panels. 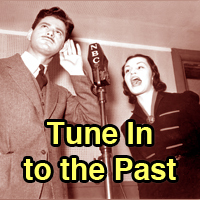 Discrete sounds—whether it’s the “FWOOSH!” of the Human Torch flaming on or long-winded pseudo-scientific explanation of the Negative Zone by Mr. Fantastic—require the passage of time to be intelligible. 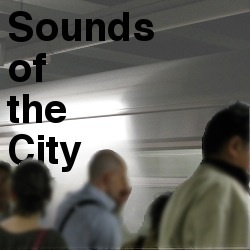 In order for sounds to be differentiated, they must have some form of beginning, middle and end (or in the parlance of synthesized sound, “attack, decay, sustain, release”). This means that in comics, a medium where space and time merge, representations of sound are crucial to making sense of action, in particular, to the passage of time within a singular panel—for while time can be shown to pass between two or more panels through the process of closure (implicitly understanding the movement or occurrence not depicted between panels that makes them sequential), a singular panel is not necessarily a discrete moment, as an entire conversation can occur within it, requiring readers to perform closure even within the scope of a single panel. 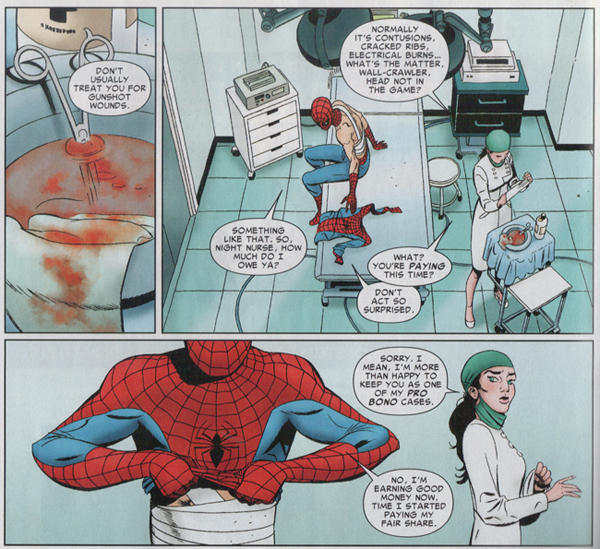 For example, in the second panel below, despite the static image, the passage of time suggested by the conversation about Spider-man’s wounds and payment leads the reader to make sense of the sequence between it and the panel that follows. It is the reader’s understanding that it takes time to talk and listen out loud that helps make the time of the panel apparent. Perhaps the most telling evidence of the centrality of sound, at least to the superhero comic genre, was Marvel’s decision to include a synopsis and explanation of the action at the end of each issue of the “‘Nuff Said,” “silent” month of comics back in 2001—wherein there was no dialogue or captions. In the end, this brief overview will hopefully serve as a starting point in generating more thoughts on not only how our familiarity with sound informs our reading and interpreting of comics, but how this (admittedly) very general idea can be applied to other ostensibly silent and primarily visual media. The use of sound in comics is a perfect example of how the transparency of sound can make it presence and function easy to overlook. Furthermore, the way in which it is used to orient the reader and help provide closure between and within panels, and identify characters clues us in to the importance of its role and the importance of considering where and how else it might function. I, for one, am going to keep thinking on it and looking for examples of in comics and hope that others join their thoughts to the discussion. Until then, as Stan Lee would “say,” Excelsior! As far as I know they are referred to as “sound words” or sometimes “visual sound effect.” Perhaps there is a trade term I am not familiar with, I will have to check with comic creator friends when I get a chance. Hey! Just saw this. Glad you enjoyed the piece. . .
Be sure to check out the related piece on sound and comics – https://soundstudiesblog.com/2012/12/31/blinded-by-the-sound-marvels-dazzler-light-sound-in-comics/ – if you haven’t yet.